Showing items in category Aitutaki, sorted by newest listed first. AITUTAKI - 1937 'Coronation' registered FDC on Cook Island adhesives. 1937 (JE.1.) 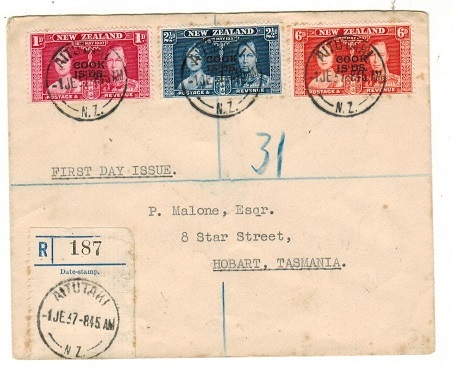 registered first day cover to Tasmania bearing the Cook Islands 'Coronation' trio tied AITUTAKI/NZ. AITUTAKI - 1942 S.S.KILAUEA maritime cover to NZ bearing Cook Island 1d strip used at AITUTAKI. 1942 (AU.21.) 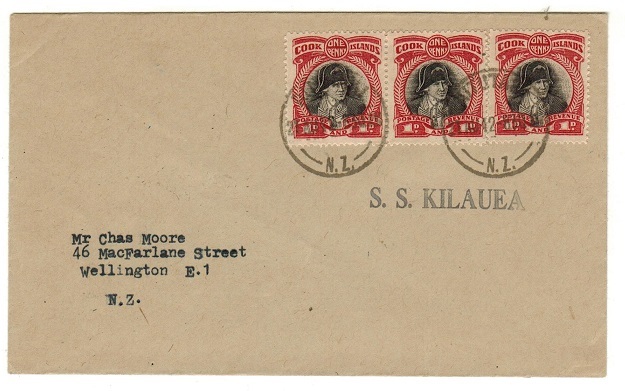 cover addressed to New Zealand bearing Cook Island 1d strip of three tied by AITUTAKI/NZ cds's with a strike of the S.S.KILAUEA maritime handstamp below from the Inter Island Navigation Company. 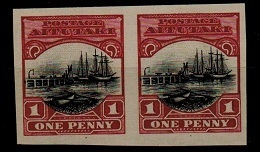 A scarce maritime cover using Cook Island adhesives. AITUTAKI - 1935 registered cover to Switzerland with Cook Island 2d + 4d used in AITUTAKI. 1935 (NO.13.) 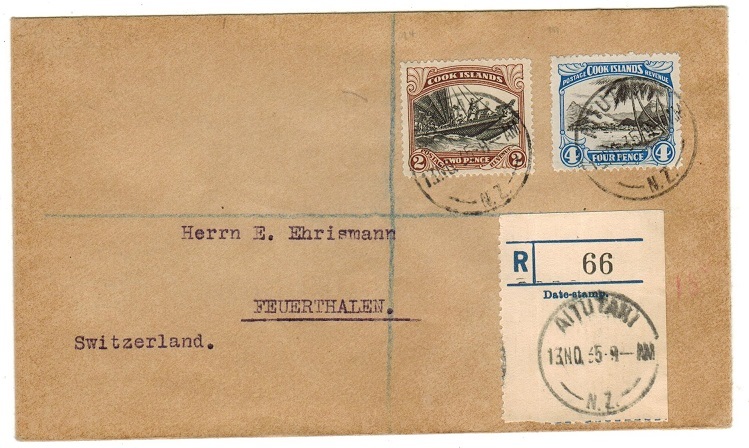 registered cover addressed to Switzerland bearing Cook island 2d and 4d 'pictorial' adhesives tied by AITUTAKI/NZ cds's and with blue on cream 'R/DATESTAMP' blank type registered label at lower right similarly struck. A scarce use of Cook island adhesives in Aitutaki. AITUTAKI - 1943 use of USA 6c orange PSE used at APO 721. 1943 (AUG.10.) 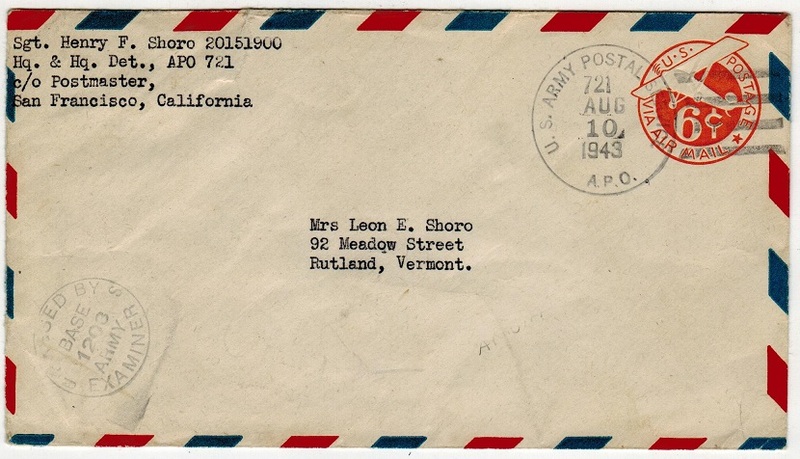 6c orange on cream postal stationery envelope of USA addressed to Vermont and cancelled by U.S.ARMY POSTAL SERVICE/721 APO cds with PASSED BY/US/EXAMINED/ BASE/1203/ARMY h/s at lower left. US troops stationed on Aitutaki. Scarce. AITUTAKI - 1940 6d registered cover to UK with Cook Island adhesives used at AITUTAKI. 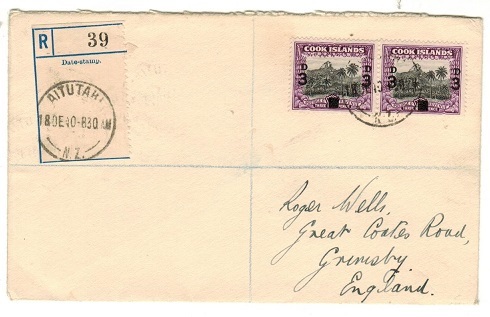 1940 registered 'Wells' cover addressed to UK bearing Cook Islands 3d on1 1/2d (SG 130) pair tied by weak AITUTAKI/NZ cds with blue on cream (blank type) registered label at left struck by clear AITUTAKI/NZ cds dated 18.DE.40. AITUTAKI - 1936 OHMS envelope to Cook Islands with scarce OFFICIAL/PAID/AIRUTAKI h/s. 1936 (NO.4.) 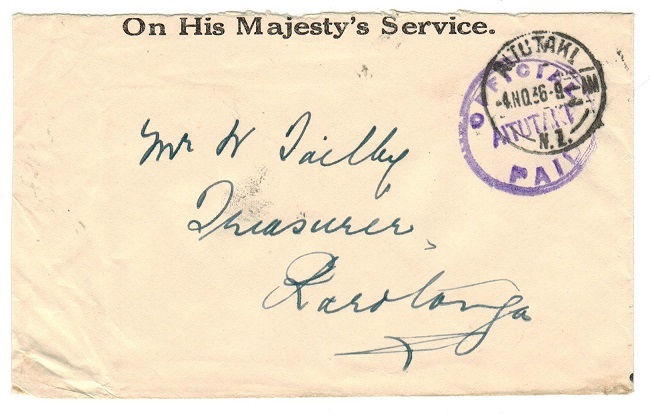 small sized stampless OHMS envelope addressed to the Cook Islands (opened on two sides) cancelled by AITUTAKI/NZ cds and struck by scarce violet OFFICIAL/AITUTAKI/PAID handstamp. AITUTAKI - 1935 registered cover to UK with Cook Island 'Silver Jubilee' 6d used at AITUTAKI. 1935 (JL.25.) 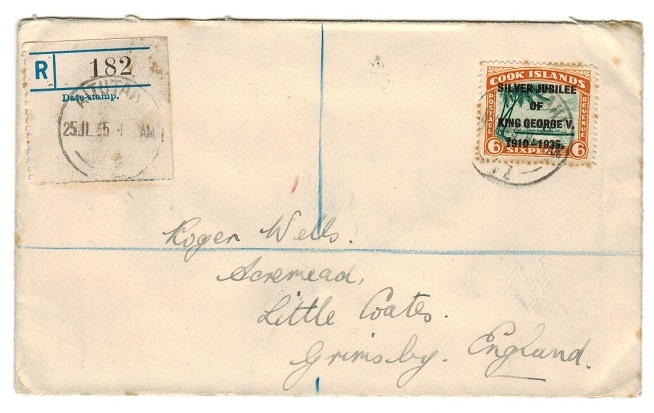 registered 'Wells' cover addressed to UK bearing Cook islands 6d green and orange 'Silver Jubilee' adhesive (SG 115) tied by AITUTAKI/NZ cds and with blue on cream R/DATESTAMP registered label at left similarly struck. A few off toned perfs but a scarcer use of this Cook Island jubilee issue in Aitutaki. AITUTAKI - 1914 registered cover to UK with AITUTAKI cds struck in 'violet' ink. 1914 (AU.30.) 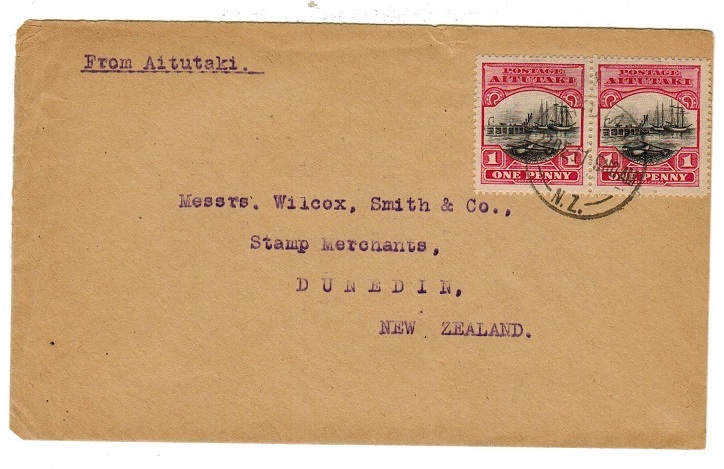 registered 'Wilson' cover addressed to UK bearing 1/2d pair and 1d (x2) tied by AITUTAKI.NZ cds's struck in 'violet' ink with R/78 (blank type) registered label at left struck by red AITUTAKI s/l handstamp. Burge type L2 with the scarce day after month variation. AITUTAKI - 1919 registered cover to UK. 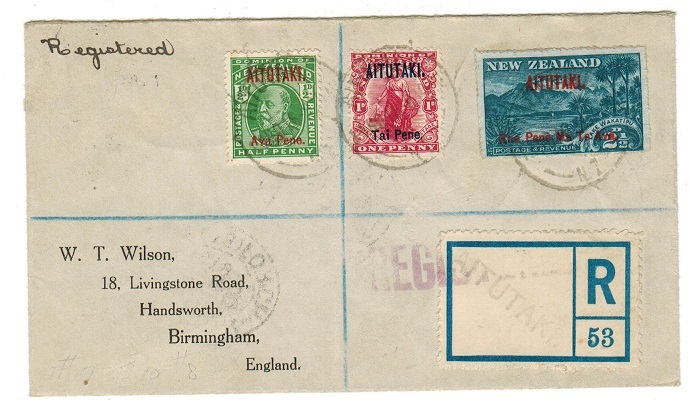 1919 (NO.18) reg'd (Wilson) cover to UK bearing 2 1/2d (SG 3) tied with 1/2d & 1d adhesives (SG9+10) by AITUTAKI/NZ cds's with blue on white 'R/53' blank reg. Label at right h/s'd by AITUTAKI s/l strike. AITUTAKI - 1911 1d mint block of eight with SHAVED T variety. SG 10. 1911-16 1d carmine in a fine mint right hand marginal block of eight (4x2) but with perfs at top edge damaged. 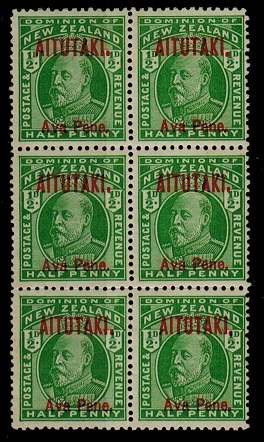 The lower row however showing the SHAVED T IN AITUTAKI variety from stamps 21-23. This being from the second printing with stamp 24 being normal. SG 10. 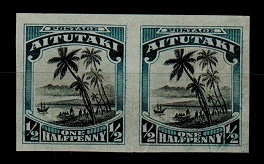 AITUTAKI - 1911 two mint copies with varieties. SG 10. 1911-16 1d carmine (SG 10). 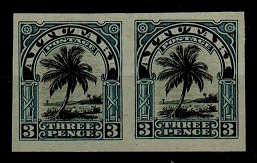 Two fine mint copies, one with BROKEN LEFT LEG OF A variety from Row 6/19 of the 1st setting and Row 4/7 of the second setting together with a copy showing SHAVED T IN AITUTAKI from stamps 21-23. 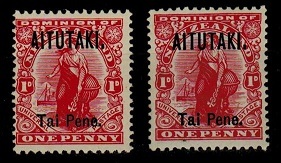 AITUTAKI - 1911 1/2d mint block of six with varieties. SG 9. 1911-16 1/2d green in a fine mint block of six (2x3) with the top and bottom pairs showing the NORMAL and DROPPED STOP se-tenant and the second stamp of the middle row showing the BREAK IN PENE variety. The first stamp with additional SHAVED TOP TO T variety from stamps 21-23. SG 9. AITUTAKI - 1920 1/2d black and turquoise IMPERFORATE PLATE PROOF pair. 1920 1/2d IMPERFORATE PLATE PROOF horizontal pair printed in the un-issued colours of black and turquoise (SG type 9) on ungummed paper. AITUTAKI - 1920 1d black and dull carmine IMPERFORATE PLATE PROOF pair. 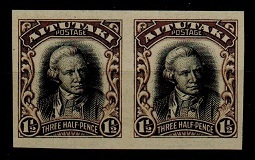 AITUTAKI - 1920 1 1/2d black and sepia IMPERFORATE PLATE PROOF pair. AITUTAKI - 1920 3d black and deep blue IMPERFORATE PLATE PROOF pair. AITUTAKI - 1920 6d Red-brown and slate IMPERFORATE PLATE PROOF pair. AITUTAKI - 1931 cover to New Zealand with 1d pair tied AITUTAKI. 1931 (DE.22.) cover addressed to New Zealand bearing 1d 'wharf' pair tied AITUTAKI/NZ cds.